The last person to see these insects alive was Charles Darwin. They were collected in Australia and Tasmania, and sent back to England for identification. Charles Darwin (1809–82) was a British naturalist and geologist, best known for his contribution to evolutionary theory. He started a medical degree in Edinburgh, only to discover that he hated the sight of blood and much preferred to explore the natural world. In January 1831, his passion for natural history led him to become the ship’s naturalist on board HMS Beagle on a voyage that would change the course of science. Towards the end of the five-year journey the ship arrived in Sydney, Australia. For the next three months, Darwin travelled around parts of Australia and Tasmania observing and collecting many species, including the insects you see here. Darwin was close friends with Frederick William Hope (1797–1862), founder of the Hope Department of Entomology in this Museum. They had regular correspondence before, during and after Darwin’s voyage on the Beagle. In one of Darwin’s letters to Hope, on display here, he mentions the specimens in these pill boxes. Hope was one of the most eminent entomologists of his time and when Darwin collected insects he often turned to Hope to help identify them. In one correspondence, in 1834, Hope promised to give Darwin 'all assistance in my power' with this task. I called yesterday on you and left a tin box with a few Hobart Town beetles, which I had neglected to put with the others. Is not there not a chrysomela among them, very like the English species which feeds on the Broom. I have spoken to Waterhouse about the Australian insects; you can have them when you like. The collections in the pill boxes come from Sydney, Hobart town, and King George’s Sound. Do you want all orders for your work?. Some are already I believe in the hands of Mr Walker, & you know Waterhouse has described some minute Coleoptera in two papers read to the Entomological Soc: To these description of course you will refer. 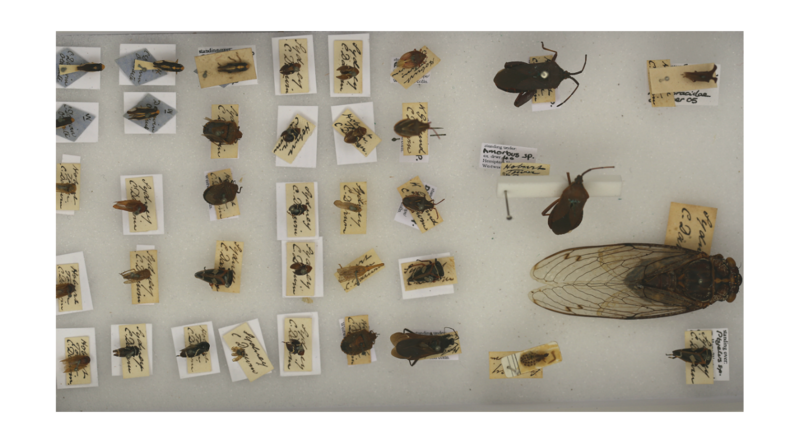 You will be glad to find that many of the minute Coleoptera from Sydney are mounted on cards. Will you send me as soon as you conveniently can, one of my boxes, as I am in want of them to transplant some more insects. Perhaps you had better return the Carabi, as they come from several localities I am afraid of some mistake. We must put out specimens for the Entomolog Soc: & your Cabinet. May I state in a note on your authority that a third or a half of the insects which you already have of mine from Sydney & Hobart town are undescribed. It is a striking fact, if such is the case, for it shows how imperfectly known the insects are, even in the close neighbour-hood of the two Australian Capitals.